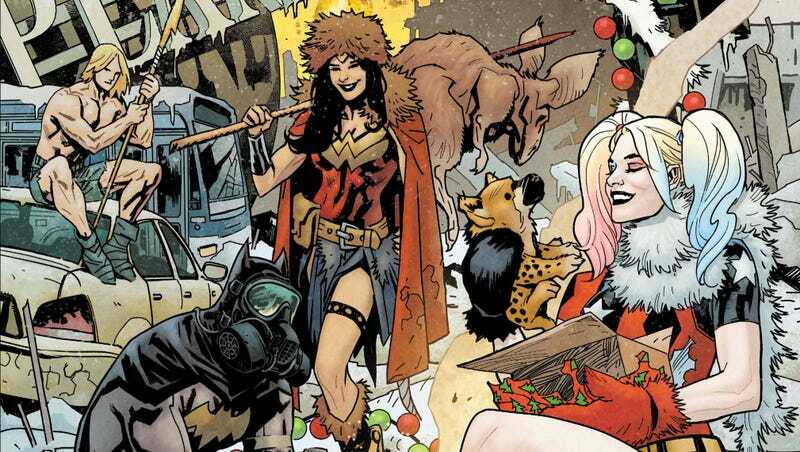 Apocalyptic thinking is all the rage in 2018, so rather than put out a holiday special this year, DC Comics is going in a very different direction for the DC Nuclear Winter Special. This one-shot contains short stories of heroes living in a variety of future scenarios, bringing in top talent to imagine how this universe will change over time. Some of the characters getting the spotlight are older versions of Aquaman, Catwoman, and Green Arrow, legacy characters like Batman 666 and Superman One Million, and DC’s original post-apocalyptic hero, Kamandi. The concept for the book might sound bleak, but editors Alex Antone and Davie Wielgosz assemble a creative roster that channels the uplifting elements of holiday stories despite the dire circumstances. This exclusive preview of this week’s DC Nuclear Winter Special #1 features a Supergirl short from writer Tom Taylor and artists Tom Derenick and Yasmine Putri, revealing a future Kara trying to save her daughter from a planet on the brink of total collapse. Taylor reaches back to Supergirl’s origins to craft a poignant story about one parent’s struggle to escape a dying world, fitting a lot of emotion into 8 pages. But the most notable thing about this tale is that it features interior artwork from Putri, who has created stunning covers for Marvel and DC over the past few years. Tom Derenick has been a go-to superhero artist for years, often as a pinch-hitter for books that have fallen behind schedule, and his understanding of superhero storytelling fundamentals give Putri a strong foundation for her lush digitally painted finishes. It’s a beautiful story, and the artwork intensifies this journey out of the darkness and into the light.